Brother To Brother | BlogAdidas Y-3Top 8 Designer Trainers for When You Want To Make A Statement! Top 8 Designer Trainers for When You Want To Make A Statement! Let’s be honest, nobody buys designer trainers to go and work out in. For many, the expense alone reserves this kind of purchase for only the most special of occasions. For others, keeping up with current styles and making a statement is number one. So, whether you’re a designer trainer aficionado looking for the latest stand out trend, or you’re looking for that one pair that will make all of your friends wild with jealousy, look no further! We’ve rounded up our favourite 8 pairs of show-stopping designer trainers to hopefully make the difficult choice a little easier! From giant fashion houses like Givenchy and Versace to top footwear brands like Amsterdam-based ETQ and Mallet Footwear, our selection suits a range of budgets and styles. Bold prints and colours meet timeless elegance. We’re sure you’ll find something you like. These black canvas slip-ons are lightweight, casual, and will not fail to get you noticed. The bold, monochromatic print features a swathe of white lightning bolts, creating a stark contrast with the dark material behind. Finished with a thick, durable white sole and a slip-on design, these trainers are perfect for if you’re always on the go. If you’re wanting a pair of trainers that are fashion-forward and eye-catching, this stormy pair will do the trick. If you like motorcycles and leather, we may have the trainer for you. From Givenchy’s Autumn/Winter 2018 collection this striking pair of trainers was designed with Motocross in mind. 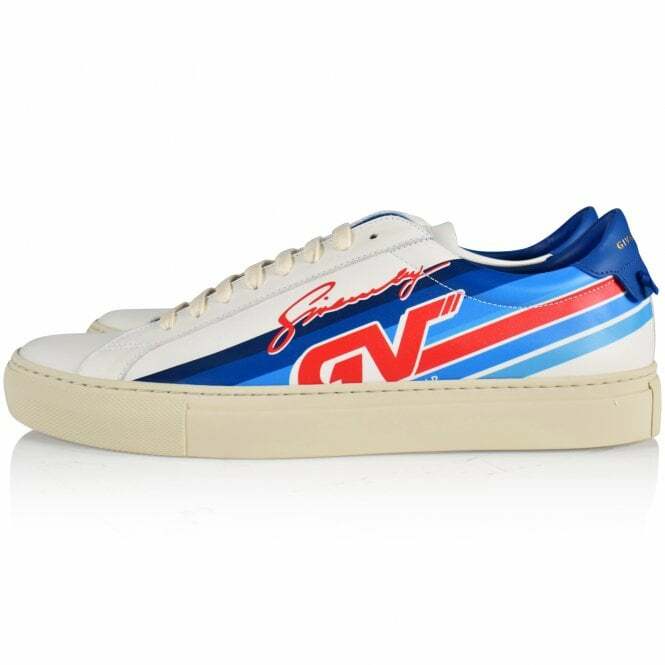 Crafted from premium leather, Italian, naturally, this pair features a cream base, a design of blue and red diagonal stripes to each side and the Givenchy GV Motocross print. The Givenchy logo is also embossed to the tongue, insole and heel. The bright, funky colours alone make these trainers stand out, however this, coupled with the luxury and splendour of real leather and the timeless design truly make this a pair not to miss. 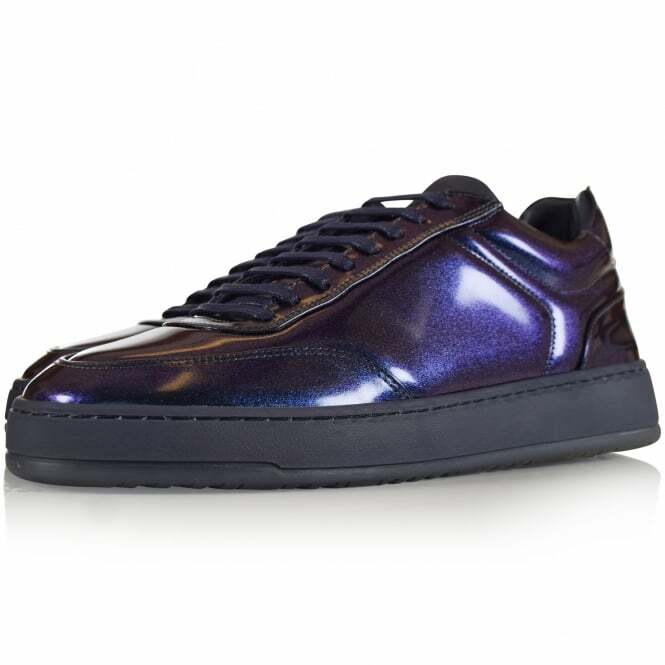 Looking at these trainers is like looking into an inky ocean, filled with deep blues, purples and iridescence. They truly are spectacular. This oil slick design by ETQ is instantly eye-catching with the colour constantly shifting and changing before your eyes. The dark black of the sole and the shoe’s interior only serve to further highlight the mesmerising effect. The sole is thick and sturdy making these trainers perfect for a night out. If you’re wanting to stop the party because everyone is too busy staring at your epic shoes, these are for you! Versace is a fashion house that does not shy away from making a statement. If there’s a little bit of you that craves a piece of that hip-hop lifestyle, buying these trainers will get you that one little step closer. 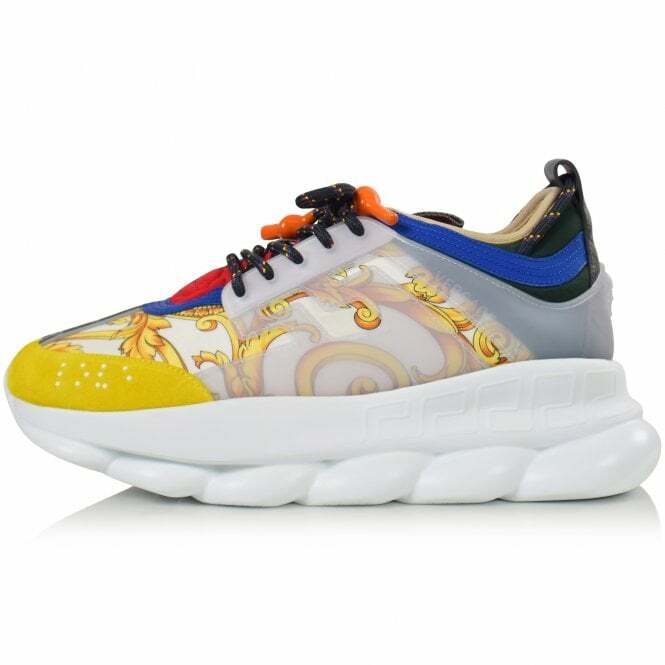 In collaboration with rapper 2 Chainz, this striking design was unveiled at Milan Fashion Week, so when it comes to a fashion-forward pair of trainers, you can’t get much better than this. The design features a sole inspired by a Cuban link chain as well as the iconic Versace Greek Key pattern. Classic, Iconic and yet new and innovative. Wannabe hip-hop legends and trendsetters alike, these trainers are for you. Have you heard of Millennial Pink? The colour that seems to be absolutely everywhere can now be on your feet with these premium suede trainers from Mallet Footwear. Whether you like it or loathe it, pink is in right now and more men than ever are embracing the colour. It’s fashion forward, and these trainers are sure to make a statement with their elegant gold accents, including the famous Mallet metal bar around the heel. Suitable for smaller budgets, this practical but stylish pair of trainers will keep you looking sharp without breaking the bank. Ralph Lauren represents timeless sophistication. A favourite of the royals, the rich and the famous, this pair of trainers can help you achieve stylish, regal elegance without the regal price tag. 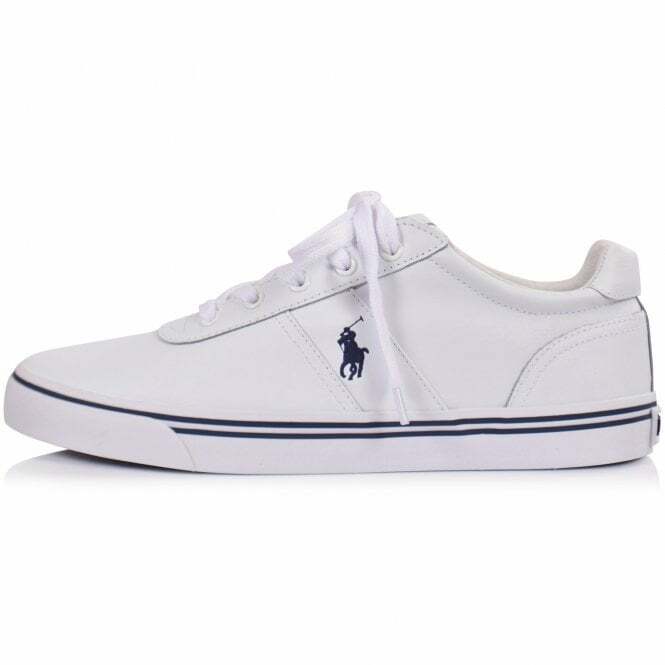 Made from white leather with a white sole and laces, simple black accents and the famous Ralph Lauren Polo logo, these trainers will compliment almost any outfit, ensuring you look suave and sophisticated from head to toe. If traditional elegance is your thing, these are for you. 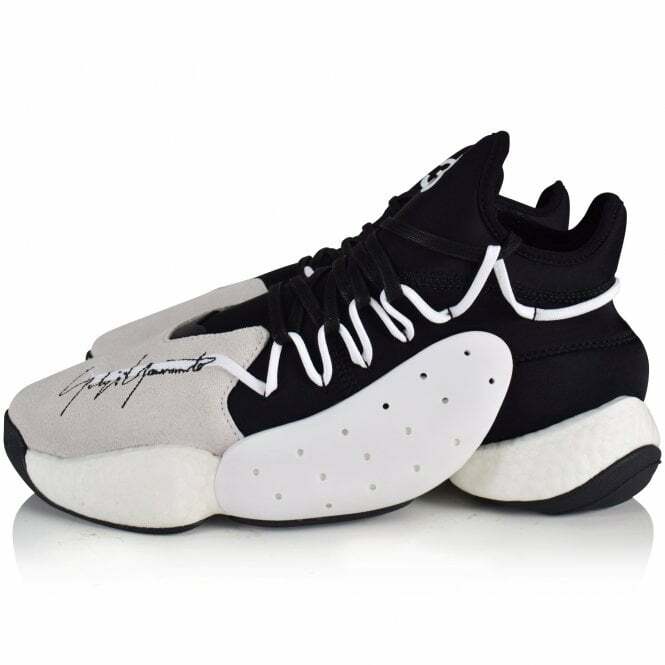 The result of a collaboration with US Basketball superstar James Harden, this innovative design, part of Adidas Y-3’s new season, represents the cutting edge of trainer fashion. Known for pushing boundaries, Adidas have cornered the market in terms of creating trainers that are both functional and hardwearing but also innovative and outside the box. The ‘oversized’ monochromatic silhouette is made of suede, neoprene and buffed leather. A touch of cream breaks up the black and white. The shape looks almost extra-terrestrial and for those that love to stop the show they would be a perfect addition to your collection. 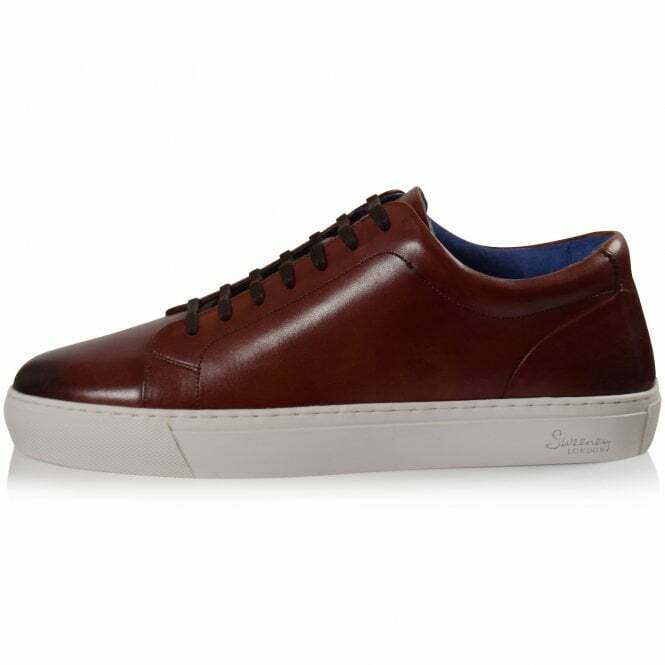 These shoes are so smart, cool and sophisticated that calling them trainers almost seems like a fallacy. If you’re a gentleman about town who prides himself on dressing impeccably, but also someone who loves the comfort of a trainer, these, my friend, are the shoes for you. Oozing with elegance the cognac brown leather upper contrasts beautifully with the sturdy white sole, while brown laces and a smart blue interior complete the look. These are the kind of trainers you’d wear to an event where trainers aren’t allowed, and you would most definitely get away with it. Hopefully at least one pair in this selection has tickled your fancy. If not, do not fret as there are thousands more to be seen. 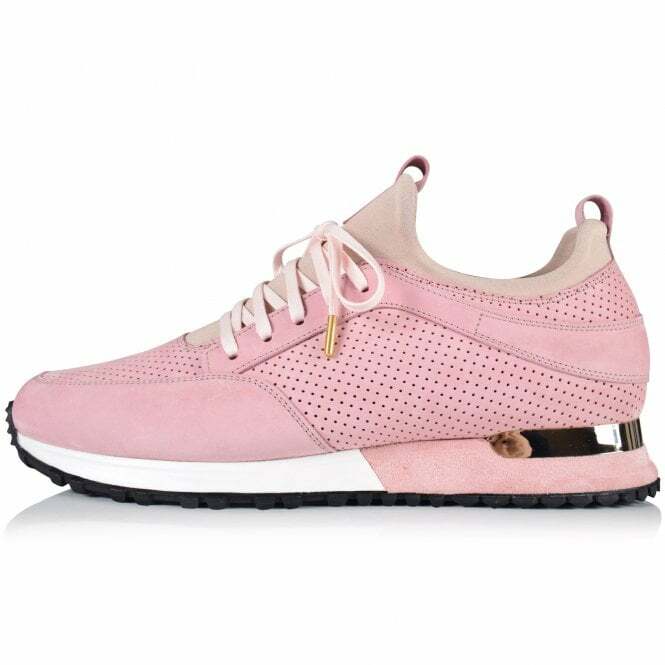 Click here to browse more Designer Trainers.